While I enjoy steampunk sci-fi as much as the next guy, I don't have the faux-steampunk-object fetish that some folks have. 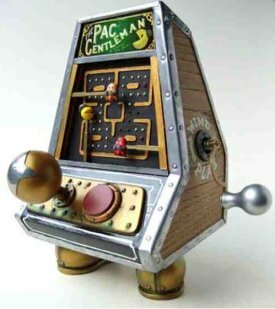 However, this steampunk rendition of Pacman (via Wonderland) is the exception. It's so awesome, I've been ruminating all morning on what it would take to build a working version using the same technique as was used for the mechanical pong machine.